Bushnell G-Force DX | Bushnell’s Best Rangefinder? The Bushnell G-Force DX is a vertical designed rangefinder with a 6x magnification and can be used for either bowhunting or rifle hunting. The new G-Force DX rangefinder is a blend of new technology combined with the mainstay of popular features found on other Bushnell models. Display – The G-Force DX features Bushnell's Vivid Display Technology red screen readout as opposed to the black display of their budget rangefinders. The intensity of this red display can be manually adjusted to one of four different brightness setting. This allows the user to adjust the intensity of the reticle and readout to their preference no matter what the lighting conditions are. MOA and MIL – When in Rifle mode the G-Force DX rangefinder is capable of displaying angle compensated holdover readings in MOA or Mil in addition to holdover in inches or centimeters. When ranging in yards the unit can be set to display holdover measurements in inches, MOA, or MIL. However, when ranging in meters the unit can be programmed to display holdover information in centimeters, MOA, or MIL. Angle Compensated Readings – While in Bow and Rifle mode many previous versions of Bushnell rangefinders would display the line of sight distance, then directly underneath that number they would display the angle of the shot, then just right of the angle a compensated yardage range (Bow mode) or holdover info (Rifle mode). This new Bushnell rangefinder displays the line of sight reading then directly below displays the angle of the shot for about a second and a half and then disappears and displays the angle compensated information. ESP 2 – Bushnell's second generation Extreme Speed and Precision processor is a new feature added to the G-Force DX rangefinders and allows for both improved speed and accuracy with which the unit ranges distance. This unit now capable of providing .5 yard accuracy out to 199 yard versus the 125 yards of the previous version G-Force 1300. Housing – Bushnell decided to use a metal houseing for this rangefinder which is also rubber coated for grip. At 4” long, 3” tall and only 1.3” thick the metal housing allowed them to make the new G-Force DX a compact laser rangefinder while retaining a relatively light weight of 8oz. Range – The G-Force is now Bushnell’s longest ranging vertical style rangefinder with a maximum range of 1300 yards on reflective targets under good conditions. Bushnell says to expect readings on trees out to about 900 yards, and readings on deer out to 600 yards. Those needing even more ranging power will need to look at the horizontal style rangefinders like a Bushnell 1600 Elite. The new G-Force DX builds on Bushnell's previous G-Force 1300 hundred design; which was a new design but did carry forward many features of the popular Bushnell Legend 1200 models. Like its predecessors the new Bushnell G-Force DX is equipped with a Bow Mode, Rifle Mode, and Regular Mode. Furthermore, the Variable Sight-In feature which allows the shooter more versatility in using the rangefinders built in ballistics charts has also been carried passed on. Finally, the popular Brush and Bullseye targets priority settings also found their way into the new G-Force DX rangefinder. Rifle Mode- When Rifle mode is selected, the user can select which sight in range he or she would like to use, and then also which ballistic chart most closely matches their guns trajectory. When ranging a rifle icon will appear at the top left of the screen to let the user know the rangefinder is in Rifle mode; once the target is ranged the unit will display the line of sight yardage, beneath that the unit will briefly display the angle of the shoot which will then be replaced with a hold over calculation in either inches, centimeters, MOA, or MIL. Bow Mode – When the G-Force DX is in Bow mode an icon of a bow and arrow will appear on the left hand side of the screen. When a target is ranged in this mode the line of sight distance will appear beneath the crosshairs, beneath the line of sight display the angle of the shot will briefly appear and then quickly be replaced by the angle compensated distance in yards. Note this unit will only show angle compensated distances out to 99 yards, and the rifle mode is not capable of displaying angle compensate yardage readings. Regular Mode – Straightforward and simple, the regular mode of this new Bushnell rangefinder will give the user a line of sight yardage distance to the target and nothing else. The angle of the shot, the angle compensate yardage, and holdover information are not calculated or displayed when in Regular mode. Bullseye – When the rangefinder is in the Bullseye mode it will report the nearer of two objects if the unit receives a split reading. For example, a deer at 150 yards and a rock at 240 yards are both ranged on one push of the button, while in Bullseye mode the yardage of the closer object will be displayed in this case 150 yards. Brush – Just the opposite of the Bullseye mode, when the rangefinder is in Brush mode it will report the furthest target when it gets a split signal. For example, a tree branch at 25 yards and a deer at 120 yards are both ranged in one press of the button. In this case the yardage of the furthest object is displayed in this case 120 yards. Brush mode works best when ranging from cover as bushes, weeds, and twigs can often cause split readings. Target Priority – Being able to select how the rangefinder handles a split reading is always a good thing. What is even better is that the rangefinder will even tell you when it is receiving a split reading by putting crosshairs around the Bullseye icon or a circle around the Bush depending what mode you are in. Adjustable Intensity – Having a red display can be troublesome, if conditions are too bright out and the display brightness isn’t high enough, the readout can be difficult to see. Also, in really low light if the display intensity is too high it can obscure the target; furthermore, there is a personal preference factor on how much display brightness is needed and when, so being able to manually control the brightness of the display when the conditions call for it is a big plus. Exterior – A metal housing that is rubberized for grip and very compact size are both good things in our book. The addition of a tripod mount is also a plus, allowing those who want to use a tripod to get the most performance out of their rangefinder, maybe getting by with this unit for the occasional trip to a prairie dog town or long range target shooting without buying a dedicated rangefinder just for these infrequent occasions. Modes – This is not just a G-Force DX thing, this is a Bushnell rangefinder issue. 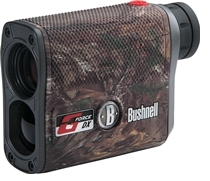 Bushnell has decided that their dual purpose rangefinders need to have a bow mode, a rifle mode, and a regular mode. Furthermore, the rifle mode requires you do essentially set up the unit for one rifle. Also, the rifle mode won’t give you a compensated yardage range, only holdover info. Many dual use rangefinder users like to program their rangefinders to give angle compensated readings in yards, and then set the unit to distant target priority and essentially never touch the settings again. If you are of this school of thought you might want to check out the Leupold RX-1200i TBR/W DNA or Nikon Prostaff 7i. However, if adjusting modes, and possibly ballistics charts between outings doesn’t bother you then you should be good to go as that is our only real complaint against this rangefinder. ESP 2 – We don’t see the need for .1 yard readouts and .5 yard accuracy out to 199 yards as being of any real benefit for hunters. That said we will always take more accuracy all else equal; however, usually these added features come at an added cost, and if that is the case 1 yard accuracy out to 125 yards and $25 dollars cheaper would have been better. As of right now it looks like the Camo model will be selling for about $399, while the black version is being listed for $379. MIL and MOA – If you are using the holdover features on this rangefinder the addition of these units of measurement might benefit you depending on your scope setup and shooting style. However, the number of hunters that are currently using these methods are probably pretty small and of those the amount that will choose this feature on this particular rangefinder is probably quite a bit smaller yet. That said a few more options in the rifle mode menu probably isn’t going to hurt much even if they aren’t used by most hunters. The new Bushnell G-Force DX builds on the success of the previous version G-Force DX. With its red adjustable intensity display, increased ranging capability, and metal housing clearly helping it stand out for many of the rangefinders it competes with. The bottom line is if you prefer your rangefinder readouts in holdover form instead of yardage the Bushnell G-Force 1300 should be on your short list.